As we often say, generally speaking, taking transit instead of driving alone is a good way to reduce greenhouse gas emissions. More about that here. It’s probably worth noting that Phil the groundhog (actually a marmot) has his critics, who say that spring has already begun to sprung in some parts of the U.S. despite the fact that it’s only Feb. 2. 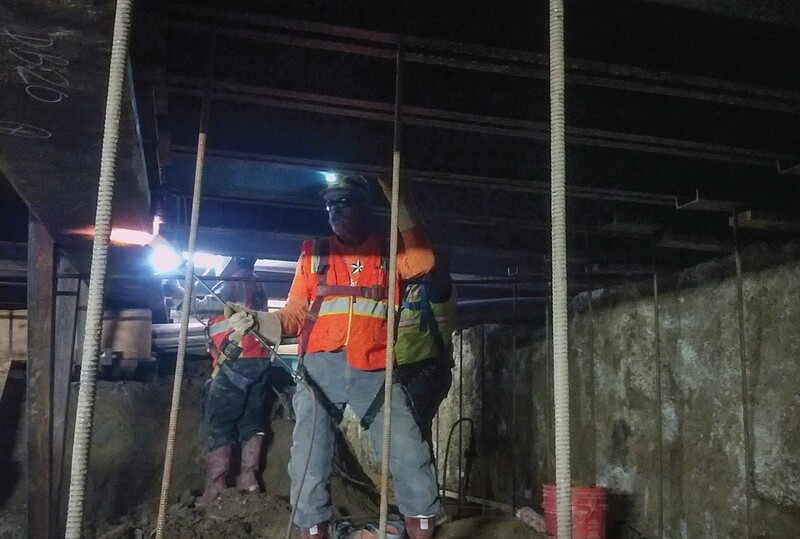 A couple more pics from my journey Tuesday into the Crenshaw/LAX tunnel between the future Martin Luther King, Jr. and Leimert Park stations. Under the street decking at the future Wilshire/La Brea Station on the Purple Line, an ironworker works on an electric duct. Photo: Metro. First, an important point: nothing has been decided yet. The technical study that is being presented to Metro’s San Fernando Valley and San Gabriel Valley Service Councils looks at some concepts for a bus rapid transit route between the Red/Orange Line station in North Hollywood and the Gold Line in Pasadena. The project is due to receive $267 million in funding from Measure M, the sales tax increases approved by L.A. County voters in November. The 501 express bus began service between NoHo and the Gold Line in Pas in early 2016 and the idea is to build on that concept. As you can see in the above presentation to the Service Councils, the primary planning question in this corridor is whether the BRT should primarily run on surface streets or the 134 freeway. The freeway route would be less expensive and faster while a street running would likely attract more riders and be closer to more work/live/shop/play destinations. The next step is to present the technical study to elected officials who serve the area and then the Metro Board. After that the formal environmental review process could begin that would more thoroughly evaluate different routes. The Metro Board will eventually be the ultimate deciders when it comes to a route. Actually, Metro CEO Phil Washington said during his State of the Agency remarks last week that Metro will be studying such a train. As Curbed reports, the study will be funded by a Measure M-funded program for “visionary” projects. There isn’t money for an express train in Measure M, but it’s certainly an interesting topic that has been discussed occasionally over the years. Measure M, however, does supply funding to build the Airport Metro Connector/96th Street Station that will serve the Crenshaw/LAX Line, Green Line and many muni bus lines and serve as the transfer point to the people mover that will carry riders to the LAX terminals. That may not be ‘express’ service, but it should result in a faster transit ride to the airport. The Green Line does have a station near the airport, but it requires a bus shuttle ride to reach the terminals and the shuttle, at times, gets caught up in airport traffic. City of Los Angeles voters in March will consider a ballot measure that would put delay approvals of large developments that would require zoning changes in the city for two years or until the city updates all its community plans. Proponents say zoning changes are too often tied to campaign contributions and increase real estate prices and traffic while opponents say that worthy developments that would increase the housing supply and improve neighborhoods would be needlessly halted. Transit is a related issue as some of the controversial larger developments in the city are near either existing or future lines. Uber was criticized for turning off surge pricing on trips to/from Kennedy Airport in NYC last weekend — with people saying that undercut the minority-heavy taxi driver community. The criticism grew quickly to the #deleteuber hashtag (here’s an NYT explainer on that) and today Uber CEO Travis Kalanick said that he will not serve on the council after all. Will Uber’s business really be impacted by all this? Hard to say, given much of their data is private. Quasi-related: in an op-ed in the N.Y. Daily News, the former transportation chief in NYC says that Uber isn’t providing data from its drivers that would help cities better plan their transportation networks. Musk’s company did dig a test trench recently at Space X headquarters, which Musk said was to determine how fast one can tunnel. 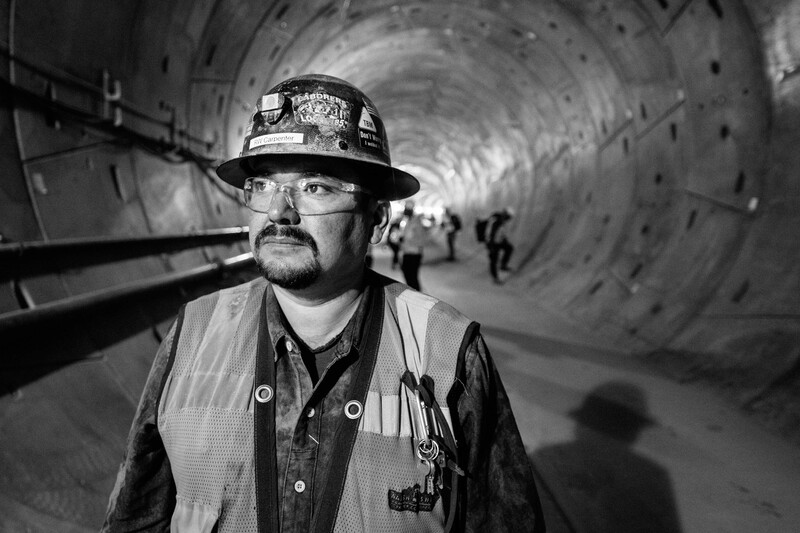 With Metro in the process of digging actual rail tunnels, KCRW points out that digging is just part of the work involved in building anything underground. Good to know. I am really excited about the future Metro North-Hollywood-Pasadena BRT! If the street alignment is going to be chosen, then it will travel through my neighborhood in Northwest Glendale. A station will also only be a four minute walk away from my home. Finally, no more multiple transfers needed if I want to travel from Glendale to Pasadena or North Hollywood. I’ll be able to enjoy a one-seat ride straight to my destination. I do not let live in the Burbank/Glendale/Eagle Rock/Pasadena corridor, but I do work and play in these areas so I am often in these areas. I will definitely be putting my input. However I would personally prefer a 3rd alternative: a hybrid of both freeway and street. Starting from PCC, the BRT makes its way through Lake then FWY until reaching the Colorado Exit making 2 stops in Eagle Rock, 2-4 stops in Glendale. And then either process as freeway (Olive/501 route) or street (Olive or Chandler) in Burbank before reaching NoHo. I feel like an all freeway option will obviously bypass ridership (Seriously, the 501 needs more street running sections), however I do also feel like an all street running section would just be slow. I actually wish the BRT line will follow the street alignment. I live in Northwest Glendale, and Glenoaks Boulevard is experiencing a lot of traffic congestion, especially during rush hour. Steve, just want to give a shout out to your powerful portrait of RW Carpenter. Your photos in general really elevate the posts on the blog but I thought this was a standout! Thank you very much for the kind words! The lights on the tunnel walls are mounted in the perfect place to light people. It was really just a matter of moving him over a little closer to the light and — boom — good pic. I converted to black and white because the construction stuff always looks more dramatic and interesting in B/W. Again, thank you! Which the people mover will not [reach the terminals]. who want a ‘train to the airport’.